Judd (Japanese: ジャッジくん Jajji-kun) is a cat in Splatoon and Splatoon 2 that plays the role of judge in Multiplayer matches. Unlike other characters, he seems to play a larger role in Splatoon's story that remains a mystery. Judd was born with the incredible ability to judge turf area at a glance to separate the winners from the losers. It may look like he is wearing a snazzy cat tuxedo, but that’s actually just the naturally occurring pattern of his fur. He is also a bit lazy, just like most cats, but is much more active during the night. This is shown in Splatfests, where he can be found dancing and saying, "Meow!" Judd returns in Splatoon 2 and once again plays the role of the referee, now joined by Li'l Judd. 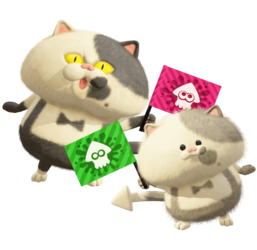 Judd represents the player's team, called "Good Guys", and Li'l Judd represents the enemy team, called "Bad Guys". When the "Good Guys" win, Judd brandishes a flag in their ink color and Li'l Judd falls down in defeat; the opposite happens when the "Bad Guys" win. He once again takes naps when not judging battles, and can be seen sleeping in Inkopolis Square with Li'l Judd sitting on top of him. Judd and Li'l Judd switch between giving advice, where the player is able to earn a Super Sea Snail from Judd each time they levels up past level 30. In Sunken Scroll 27 in Splatoon 2, it is implied that Li'l Judd is a clone of Judd, created upon reactivating the device that brought him to the future. Judd's voice clips in Splatoon, either of which are used for the "Meow!" at the beginning of a piece of advice. Judd's name is derived from the word "judge," as he is the referee for all the battles in Splatoon. In Judd's pieces of advice in the North American versions, he includes a large number of puns pertaining to cats. Along with a handful of birds and insects, Judd is one of the few non-aquatic creatures in the game. As stated in a developers' interview, this is because of the fact that the main characters of Splatoon were originally going to be rabbits; Judd is a leftover from that stage of the game's development. Also explained in the interview is the source of Judd's name; apparently, the pattern of his fur came first, and it caused some developers to nickname him ジャッジ, or "Judge", which is his final name in the Japanese version of Splatoon. A cat resembling Judd was depicted in an ancient scroll from around 2,000 years ago. Cats generally have a lifespan of fifteen years. It is unknown if this cat is the same as Judd after awakening from cryostasis, or if it is related to the machine Judd laid dormant in, which also has the capability of creating a clone of Judd as revealed in Splatoon 2. Li'l Judd appears to be noticeably larger while judging matches in comparison to Judd than while he is sitting on Judd in Inkopolis Square. It is said by Marina that Judd poses for an online art class at Inkblot Art Academy. Japanese dialogue adds that he does this because fluffy creatures like him are so rare. Also at Inkblot Art Academy, Marina implies that Judd and Li'l Judd's eyes glow in the dark. Judd as he appears in Splatoon. Judd with his unnamed human owner in an article dated at least 12,000 years prior to the events in Splatoon. Judd waving a flag with Li'l Judd. A match where Judd has lost. Animation of Li'l Judd on top of a sleeping Judd. Sunken Scroll 26, showing Judd's capsule being accidentally unplugged. Sunken Scroll 27, indicating the origins of Li'l Judd. A mem cake with Judd and Li'l Judd (upper left) in a promo for Splatoon 2's Octo Expansion. Judd and Li'l Judd wearing bows for the result of the Hello Kitty vs. Cinnamoroll Splatfest. The same thing for the My Melody vs. Pompompurin Splatfest. A picture of Judd with Marina from when she first met Pearl, shared in Marina's chat room.